The Call of the Wild is a novel by American writer Jack London. The plot concerns a previously domesticated happy dog named Buck, whose primordial instincts return after a series of events leads to his serving as a sled dog in the Yukon during the 19th-century Klondike Gold Rush, in which sled dogs were bought at generous prices. Published in 1903, The Call of the Wild is London's most-read book, and it is generally considered his best, the masterpiece of his so-called "early period". Because the protagonist is a dog, it is sometimes classified as a juvenile novel, suitable for children, but it is dark in tone and contains numerous scenes of cruelty and violence. 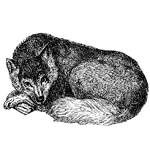 London followed the book in 1906 with White Fang, a companion novel with many similar plot elements and themes as Call of the Wild, although following a mirror image plot in which a wild wolf becomes civilized by a mining expert from San Francisco named Weedon Scott. Source: London, J. (1903). The Call of the Wild. New York, NY: Macmillan. Buck's pampered existence comes to a sudden and unexpected end. Buck begins to understand the harsh nature of his new surroundings. Buck is put to work. Buck struggles, but continues to prevail. Spitz and Buck nearly come to blows. The sled team continues down the trail, where an undeclared war comes to a dramatic end. Buck takes Spitz's old spot, proving himself to be very proficient in his new job. The exhausted sled team arrives at Skaguay, where they meet their new owners. Having been driven hard, Buck eventually begins to regain his strength. Buck faithfully serves his master John Thornton. John Thornton settles his debts and he and Buck head east where they soon find a good fortune, but it does not last. Buck joins a new pack. London, Jack. The Call of the Wild. Lit2Go Edition. 1903. Web. <https://etc.usf.edu/lit2go/151/the-call-of-the-wild/>. April 24, 2019. Jack London, The Call of the Wild, Li2Go edition, (1903), accessed April 24, 2019, https://etc.usf.edu/lit2go/151/the-call-of-the-wild/.